Our 2 inch Alchemist Copper Still is not just an average column still! You can call it a LIQUID MANGEMENT STILL or a Forced Reflux Still. This means you can adjust the reflux and the cooling. The Alchemist tower is not just a regular column still. You can manipulate through a cooling management, meaning that you can manipulate the cooling of the coils. You can adjust the reflux ratio with the tap. This unit is a Hybrid Still that is capable of distilling either as a column still or if the column is bypassed, a pot still. Nothing should touch your product but glass, stainless steel or copper! 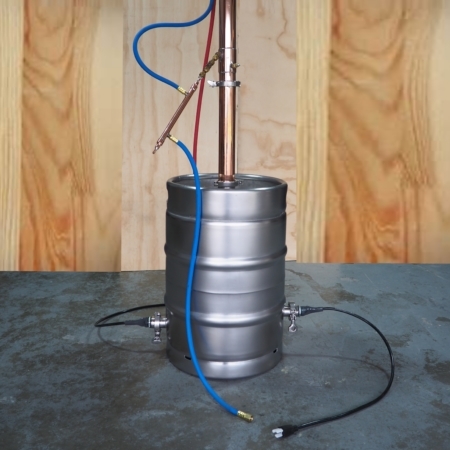 Each 2″ moonshine still and tower comes with one free extension. The 3″ comes with two extensions and the 4″ comes with four modulars. Why should you use copper? Copper is what all professional chefs and cooks use as well as high quality essential oil distillers and all the micro, craft and large distilleries. Copper enhances flavors. Copper has a natural ability to make a great product and remove sulphurs from material, this helps to remove unwanted flavors. 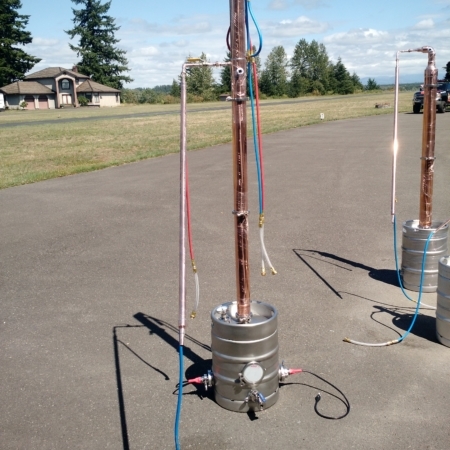 Our copper Alchemist Moonshine Still comes in three sizes and they all work exactly alike. The difference is in output and purity. 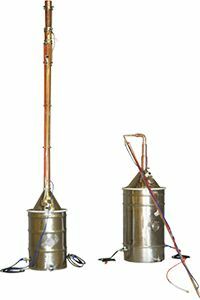 All of our Alchemist Moonshine Stills can be turned into pot stills as well as reflux. These units are one of a kind. The Alchemist Moonshine Still can do 90-95% ABV (Alcohol by Volume), comfortably, all due to length of the columns. Our three inch and four inch moonshine stills will do 94-95% ABV in one run if the mash is done correctly. Please call us if you need help understanding this process. Our unit has been feature in Farm Show Magazine. We make them by hand in 2, 3, and 4 inch sizes.These Stills specialize in high proof alcohol. These come with boilers that are electrical, and they come in 15, 50 and 100 gallon boilers. You can just take out the elements and cover the holes with caps to use over propane or wood fire. All these sizes work the same but produce different outputs. The 2 inch produces a minimum of one gallon per hour of product. A 3 inch will do 3-5 gallons an hour, and a 4 inch will do 7 gallons or more an hour. It is a copper reflux still, under no pressure.They also can be taken apart- and made into a pot still. We also sell basic traditional pot stills in a 2, 3 and 4 inch. The Alchemist Moonshine Still can even be an essential oil extractor. All you have to do is add on an Extension for botanicals. With this extractor, you can also make infusions to your alcohol with herbs, spices, flowers etc.